Indian investors are skeptical of the viability of solar power thanks to the potential bankruptcy of SunEdison, the “world’s largest green energy company,” and that skepticism is threatening the country’s plans to invest another $100 billion into solar. Last week, a lawsuit filed by TerraForm Global Inc, a company that SunEdison controls, claims the giant green energy company misused$231 million earmarked for solar projects in India. This forced the company to attempt to sell off unfinished Indian solar projects to pay the $1.4 billion it owes creditors. SunEdison was previously the largest foreign solar power provider in India. The prime minister of India previously stated he wants to invest $100 billion into Indian solar power by 2022, but the ongoing fall of SunEdison has made investors nervous. The company’s shares fell by 95 percent over the past year, and are trading for less than $1 for the first time since the company went pubic. Securities and Exchange Commission’s (SEC) March filing from TerraForm Global, a unit of SunEdison, claims “due to SunEdison’s liquidity difficulties, there is a substantial risk that SunEdison will soon seek bankruptcy protection.” Both SunEdison and TerraForm have delayed filing their annual financial report to the SEC. Solar power in India is critical to global warming alarmists because the country is the world’s third largest and fastest growing emitter of carbon dioxide (CO2). Attempts to reduce the CO2 emissions of developing economies like India have historically been very ineffective as they are inevitably costly and reduce economic growth. 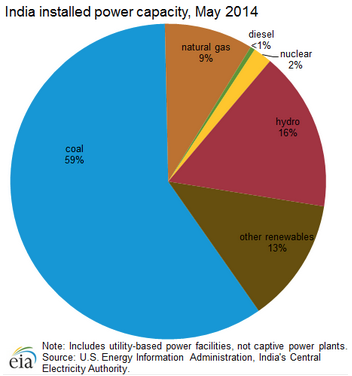 India is deeply dependent on coal power and got 59 percent of its electricity from coal in 2014. Indian leaders are increasing the country’s coal production by opening a new mine every month as well as purchasing roughly nine percent of America’s coal, according to the Energy Information Administration. “[O]ur dependence on coal will continue. There are no other alternatives available,” a top Indian coal ministry bureaucrat told Reuters in December. India says coal provides the cheapest energy for the kind of rapid industrialization that will lift millions out of poverty.